North and South Korea launched long-awaited reunions of separated families on Tuesday. Buses filled with smiling and joyous Koreans from the South crossed into the North. Some family members have been separated for more than 60 years. "I feel really thrilled and happy," said Oh Cheol-Hwan of South Korea. "I am 77 years old, and my brother is 83 years old. I want to see him. I want to see him right away." North and South Korea planned three days of reunions at the Kumgang Mountain resort just north of their shared border. South Korea's Unification Ministry says the first reunion group has nearly 400 people from the South, and about 140 from the North. The Korean War from 1950 to 1953 displaced millions of people. The conflict separated families and friends. 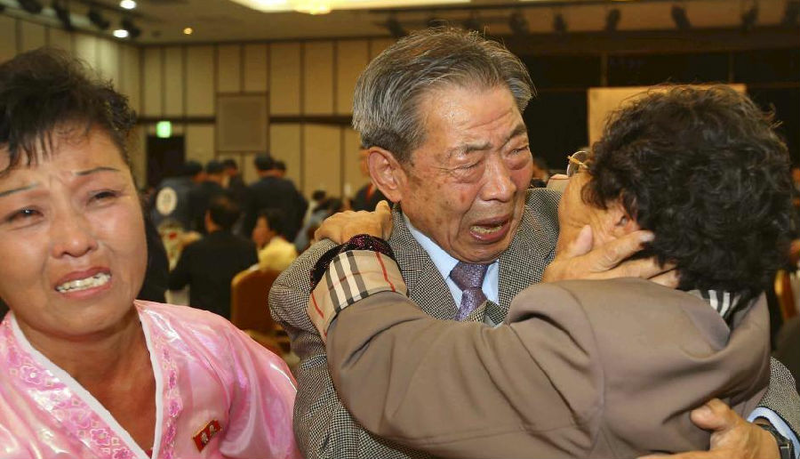 Only 20 inter-Korean reunions have been held since 2000. For 60 years, separated families were not permitted to meet in person or exchange telephone calls or letters. Close to 60,000 South Koreans are waiting to take part in the reunions. "I can't think of what to say," said 76-year-old South Korean Kim Ki-Joo, who planned to meet his older brother in North Korea. "We are being reunited after 65 years." The reunions came to pass after an agreement was reached in August. Family meetings were suspended in 2010 and 2013 after tensions worsened between North and South Korea. She read the long-awaited letter with a tearful smile. He painted day and night to make a living, and his health worsened. He gave way to fantasies of a passionate reunion. The long-lasting unification of Tibet with other parts of China is the inevitable outcome of a long history. 1.North and South Korea began long-awaited reunions of separated families on Tuesday. Buses filled with smiling and joyous Koreans from the South crossed into the North. Casual conversation tends to be filled with repetition. He was filled with a fear such as he had never known. 2.Close to 60,000 South Koreans are waiting to take part in the reunions. "I can't think of what to say," said 76-year-old South Korean Kim Ki-Joo, who planned to meet his older brother in North Korea. "We are being reunited after 65 years."